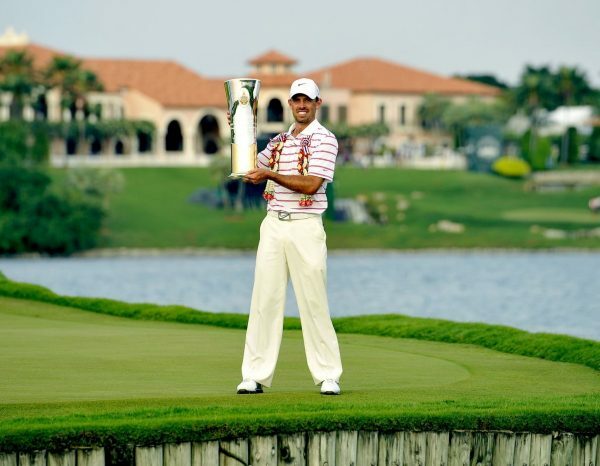 The 28-year-old Schwartzel completed an imperious start-to-finish victory at Amata Spring Country Club with a final round of seven-under-par 65, which made up for last year’s runner-up result where he ended seven shots behind inaugural champion Lee Westwood. Schwartzel’s winning total of 25-under-par 263 total saw him pick up his ninth career victory and first on the Asian Tour. He won US$158,500. Thai youngster Thitiphun Chuayprakong shot a closing 70 finish tied second with reigning Masters champion Bubba Watson, who closed with a superb 65 for a 14-under-par 274 aggregate. Spaniard Sergio Garcia came in fourth after a 70, followed by Korea’s Park Hyun-bin, whose fifth place performance following a 68 earned him his Asian Tour card for 2013. “It’s been a great week. We had such a good time last year and obviously I came in second. I do know how the guys feel like as I had the same feeling last year when I lost to Lee by quite a margin. I played some solid golf. I’m very happy,” said Schwartzel, whose 11-shot winning margin was the third highest on the Asian Tour. Such was his great form that the South African dropped only one bogey all week, at the ninth hole on Saturday. Leading by five overnight, he did not allow his rivals to get close to him as he turned in 32 for a 10-shot advantage before easing home with three more birdies on the back nine in front of large galleries. After saving par from six feet at the last hole, Schwartzel raised both arms in jubilation and relief. “It’s always hard when you’ve won such a big tournament (and not win again). You go on a high and you feel that you can win all the ones that you play in. I came close a few times. Winning is not as easy as everyone makes it out to be. You know, it’s been quite hard work and it’s been a difficult year especially in the middle (when he was injured). It’s nice to put things in place and get the win that I’ve been looking for a while,” said Schwartzel. The 20-year-old Thitiphun held his head high against the stars of the game after enjoying his best Asian Tour finish yet alongside Watson, earning US$84,750. He fired an eagle, three birdies and three bogeys playing in the last group for the second straight day. “I’m so proud with how I played because I played with one of the best players in the world. The way he (Schwartzel) handles himself was fantastic. This is a great feeling for me,” said the ever-smiling Thitiphun. Left-hander Watson saved his best for last with a seven-birdie round as he thrilled the galleries with his “Bubba Golf”, attacking the pins with ease at Amata Spring. “I didn’t have my best stuff on Friday and Saturday and made a lot of mistakes. Schwartzel played pretty good and my best stuff probably wouldn’t be as good. It would have given me a chance to scare him but I didn’t have my best in the previous two days. I had no bogeys and no mistakes today and somehow it came out to a seven-under,” said Watson. Europe’s Ryder Cup star Garcia saluted Schwartzel for his commanding performance. “It is funny how Charl and Lee can shoot 20-under in the last two years because it doesn’t feel like you can shoot that kind of scores on this golf course. They both deserved their wins but I can’t be disappointed with the way the week went for me,” said the Spaniard, who will play the Iskandar Johor Open, the Asian Tour’s season-finale in Malaysia next week. 263 – Charl SCHWARTZEL (RSA) 65-65-68-65. 274 – Bubba WATSON (USA) 68-70-71-65, Thitiphun CHUAYPRAKONG (THA) 66-67-71-70. 276 – Sergio GARCIA (ESP) 69-69-68-70. 277 – PARK Hyun-bin (KOR) 68-74-67-68. 278 – Kiradech APHIBARNRAT (THA) 68-71-72-67, Prom MEESAWAT (THA) 69-72-70-67, Simon DYSON (ENG) 72-71-67-68, Scott HEND (AUS) 70-68-69-71, Daniel CHOPRA (SWE) 67-67-69-75. 279 – Jonathan MOORE (USA) 73-72-67-67, Chapchai NIRAT (THA) 70-73-67-69, Ryo ISHIKAWA (JPN) 70-66-73-70, Lee WESTWOOD (ENG) 70-69-70-70. 280 – Anirban LAHIRI (IND) 70-69-70-71, Nicolas COLSAERTS (BEL) 72-67-70-71. 281 – Kalle SAMOOJA (FIN) 71-72-72-66, Yoshinobu TSUKADA (JPN) 70-72-72-67, Thongchai JAIDEE (THA) 69-71-72-69, Darren BECK (AUS) 69-70-72-70. 282 – Shiv KAPUR (IND) 73-71-72-66.